John VI Kantakouzenos, Cantacuzenus, or Cantacuzene (Greek: Ἰωάννης ΣΤʹ Καντακουζηνός, Iōannēs ST′ Kantakouzēnos; Latin: Johannes Cantacuzenus; c. 1292 – 15 June 1383) was a Greek nobleman, statesman, and general. He served as Grand Domestic under Andronikos III Palaiologos and regent for John V Palaiologos before reigning as Byzantine emperor in his own right from 1347 to 1354. Usurped by his former ward, he retired to a monastery under the name Joasaph Christodoulos and spent the remainder of his life as a monk and historian. Born in Constantinople, John Kantakouzenos was the son of Michael Kantakouzenos, governor of the Morea; Donald Nicol speculates that he may have been born after his father's death and raised as an only child. Through his mother Theodora Palaiologina Angelina, he was related to the then-reigning house of Palaiologos. He was also related to the imperial dynasty through his wife Eirene Asanina, a second cousin of Emperor Andronikos III Palaiologos. Kantakouzenos became a close friend to Andronikos III and was one of his principal supporters in Andronikos's struggle against his grandfather, Andronikos II Palaiologos. On the accession of Andronikos III in 1328, he was entrusted with the supreme administration of affairs and served as Grand Domestic throughout his reign. He was named regent to Andronikos's successor, the 9-year-old John V, upon the emperor's death in June 1341. Kantakouzenos apparently began with no imperial ambitions of his own, having refused several times to be crowned co-emperor by Andronikos III. After the death of the emperor, Kantakouzenos again refused to take the throne, insisting on the legitimacy of John V's claim and contenting himself with overseeing the empire's administration until the boy came of age. Whether he would have remained loyal is unknowable but, despite his professed devotion to John V and his mother Anna, she came to suspect him of treason. His close friendship with the late emperor and power over his successor had aroused the jealousy of his former protégés, the Patriarch John Kalekas and Alexios Apokaukos; after a series of failed attempts, they succeeded in overthrowing his regency in September 1341 while he was out of the capital readying an army against the Crusader principalities that still held parts of the Peloponnesus. He attempted to negotiate with the usurpers, but this was rebuffed and his army was ordered to disband. Further, his relatives in Constantinople were driven into exile or imprisoned, with their property confiscated by the new regents. His mother Theodora died owing to the mistreatment she suffered while under house arrest. His army ignored the new regents' orders and proclaimed Kantakouzenos emperor at Didymoteichon in Thrace as John VI. He accepted this, while continuing to style himself as the junior ruler to John V.
The ensuing civil war lasted six years; calling in foreign allies and mercenaries of every description, the two sides completely disrupted and almost ruined the empire. At first, John VI was obliged to flee to Serbia, where Stefan Dušan protected his men and helped them secure areas of the Balkans. The Serbians changed to support the regents and John VI struck a disgraceful bargain with the Turks, giving Orhan, bey of Bursa, his daughter for his harem and permitting him to take Greek Christians as slaves. The Greco-Turkish force prevailed and John VI entered Constantinople in triumph in 1346 or 1347. [n 1] His opponents—including the patriarch—were deposed from their positions and his status as co-emperor was legitimized. During John's reign, the empire—already fragmented, impoverished, and weakened—continued to be assailed on every side. The Genovese, disregarding the terms of the treaty which permitted their colony at Galata, began fortifying and arming it. Their customs dues undercut the Byzantines and meant that as much as 87% of the revenue from control of the Bosphorus went to them instead of the empire. 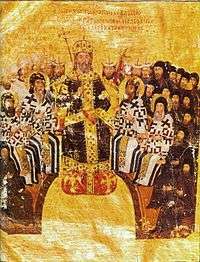 John VI attempted to rebuild the shattered Byzantine navy in preparation for the war he expected to follow a reduction of Constantinople's own customs dues. He was able to borrow enough to construct 9 fair-sized ships and about 100 smaller ones before he lowered the rates and began siphoning off Genoa's income. When they did declare war, however, they were able to sink or capture his fleet by early 1349. The Genovese were forced to negotiate after major areas of Galata were burnt, including its wharves and warehouses, but the Byzantine Empire thenceforth was forced to turn to an alliance with the Republic of Venice for naval protection. This led to their involvement in Venice's 1350 war against Genoa, but Paganino Doria was able to force John VI (and the twelve ships he had fielded) out of the war by a Pyrrhic victory off Constantinople the next year. 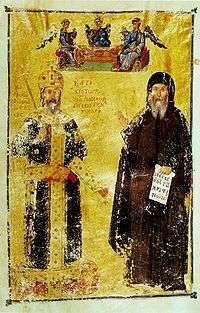 In 1351, Kantakouzenos oversaw the Eastern Orthodox Ninth Ecumenical Council of Constantinople, wherein Gregory Palamas' mystical Hesychastic theology was declared Orthodox over the rationalistic theology of Barlaam of Calabria and Western Scholasticism. By this time, Stefan Dušan had taken Albania, Macedonia, and Epirus. John VI secured help against further incursions by again allying with the Turks. Following an earthquake, they annexed Callipolis (Gallipoli)—their first foothold in Europe—in partial payment of his many debts in 1354. He made his son Matthew Kantakouzenos another co-emperor in 1353, but John VI's attempts to expand taxation to repay the government's debts had long been displeasing. He was removed from power by John V at the end of 1354. Kantakouzenos retired to a monastery, where he assumed the name of Joasaph Christodoulos and occupied himself with literary labors, which have been called eloquent. His 4-volume History of the year 1320-1356 served as an apologia for his actions. They are therefore not always trustworthy, including defects in matters where he was not personally involved, but are supplemented by the contemporary work of Nicephorus Gregoras. In 1367 Joasaph was appointed the representative of the Eastern Orthodox Church to negotiate with the Latin Patriarch Paul to attempt a reconciliation of the Eastern Orthodox and Roman Catholic Churches. They agreed to call a grand ecumenical council to be attended by the Pope and all the patriarchs, archbishops, and bishops of both the eastern and western churches. This plan was subsequently refused by Pope Urban V and so nothing came of it. Kantakouzenos died in the Peloponnese and was buried by his sons at Mistra in Laconia. Kantakouzenos's 4-volume History was published by J. Pontanus in 1603, by J. Schopen at Bonn as part of the Corpus Scriptorum Hist. Byz. c. 1830; and by J.-P. Migne at Paris. He also wrote a commentary on the first five books of Aristotle's Ethics and several controversial theological treatises, including a defense of Hesychasm and a work Against Mohammedanism printed in Migne. ↑ His entry into the city later formed the subject of Constantine Cavafy's poem "John Kantakouzenos Triumphs". ↑ EB (1911), p. 438. 1 2 3 4 EB (1911), p. 439. ↑ Ristelhueber, René, A History of the Balkan Peoples, p. 35 . ↑ Peter F. Sugar, Southeastern Europe Under Ottoman Rule, 1354-1804, (University of Washington Press, 1996), 15-16. "Johannes Cantacuzenus", Encyclopædia Britannica, 9th ed., Vol. V, New York: Charles Scribner's Sons, 1878, p. 27 . "John VI. or V.", Encyclopædia Britannica, 11th ed., Vol. XV, Cambridge: Cambridge University Press, 1911, pp. 438–439 . Oxford Dictionary of Byzantium, Oxford: Oxford University Press, 1991 . Harris, Jonathan (2015), The Lost World of Byzantium, New Haven: Yale University Press . Nicol, Donald M. (1996), The Reluctant Emperor: A Biography of John Cantacuzene, Byzantine Emperor and Monk, c.1295-1383, Cambridge: Cambridge University Press .